Vijay Meunier and Jessie Acker-Johnson were Concert Prize Winners of the 2014 CGST International Guitar Competition held in December of 2014. The FSU College of Music and the Classical Guitar Society of Tallahassee will present the internationally renowned Amadeus Guitar Duo featuring Dale Kavanagh and Thomas Kirchhoff in concert on Wednesday, March 4, 2015 at 8:00 pm. The performance will take place in Dohnanyi Recital Hall inside the Housewright Music Building at the corner of Copeland and Call Streets. The Amadeus Duo will present two masterclasses on Thursday evening at 6:30 pm at the College of Music. Admission to the concert is $10 general admission at the door, and the masterclasses will be free to audit. Dale Kavanagh (Canada) & Thomas Kirchhoff (Germany) of the Amadeus Guitar Duo have been performing together since 1991. Their program will feature music from Europe and South America and includes “Madrigal Suite” by the Spanish composer Joaquin Rodrigo, “Introduccion y Forreando Caprichoso” by the Bolivian composer Jaime M. Zenamon, and “Amasur” by Alfonso Montes (also Bolivian) as well as works by George Friedrich Händel (Germany) and Mario Gangi (Italy). Favorites of Tallahassee audiences, the Amadeus Guitar Duo has appeared several times at FSU as guest artists. Of their return engagement, Bruce Holzman, Associate Professor of Guitar at FSU said, “We are again lucky to have Dale and Thomas back to perform. Each time they have played for us, the audiences have left wanting more. Their performances are dynamic, exciting and are at the highest level of artistic achievement.” Their stop at FSU is one of many in their 2014-2015 tour which includes performances in Canada, Germany, Switzerland, Italy, Canada, Austria, United States, South Korea, China, Thailand, England, Turkey, Romania, and Greece. In addition to their extensive tours and recording schedule where they have produced 16 titles on the Haenssler-Classic FONO label, both Kavanagh and Kirchhoff teach at the Musikhochschule in Detmold, Germany and have established one of the largest classical guitar summer festivals in Iserlohn, Germany. The Classical Guitar Society of Tallahassee, the Classical Guitar Society at FSU and the FSU College of Music will present Kevin Ginty and Steven Jay Lerman in concert on Wednesday, February 25, 2015 at 6:30 pm in Dohnanyi Recital Hall, Housewright Music Building, FSU, at the corner of Copeland and Call Streets. Kevin and Steven were Concert Prize Winners of the 2014 CGST International Guitar Competition held in December of 2014. The concert is free. Kevin Ginty is an active classical guitarist, teacher, and arts administrator in the Tallahassee community. In 2010, Kevin moved from his hometown of Las Vegas, Nevada to Tallahassee in order to pursue a Bachelor of Music degree in Guitar Performance from the College of Music at Florida State University. During his time as an undergraduate at FSU, Kevin co-founded The Classical Guitar Society at Florida State University (CGS@FSU) and was one of a select few undergraduate students to take private lessons with renowned pedagogue Bruce Holzman. Upon graduating in the spring of 2014, Kevin was offered an administrative assistantship to complete a Master’s of Arts in Arts Administration at FSU. This unique degree program allows Kevin to learn vital skills in non-profit arts management, while still maintaining his craft as a musician. Kevin hopes to use these professional abilities to help create a thriving community for classical guitar in Tallahassee. Kevin’s program will include works by Leo Brouwer, Issac Albeniz, and Joaquin Rodrigo. Steven Jay Lerman began studying classical guitar at the age of 16 in San Diego, CA. Just 3 years later Steven was offered a full-tuition music scholarship to attend the University of Arizona’s world renowned Bolton Guitar Studies program. During his undergraduate study, Steven served as the artistic director for the Tucson Guitar Society, was a member of the Tucson Guitar Orchestra, taught in public schools throughout Arizona, and managed a private lessons studio. In 2012 Steven was awarded a research grant that paid for travel to Canada to study with Grammy-Award-Winning Brazilian guitarist and composer Sergio Assad. The following year he was invited to present his research at the University of Arizona research exposition, and was subsequently one of only four chosen to be featured researchers. Steven is a frequent competition participant. He has won 3 and reached the finals of 12 classical guitar competitions, winning over $15,000 in cash and prizes. Steven has performed in masterclasses for some of the most important classical guitar figures including: David Russell, the Assad brothers, Solo Duo, Nicholas Goluses, Rene Izquierdo, Johannes Moller, Vladimir Gorbach, Marcin Dylla, Carlos Perez, Carlos Bonnell, Anton Baranov, and Pavel Steidl. Steven has been able to study privately with Thomas Viloteau, Tom Patterson, and Bruce Holzman; some of the top teachers in the world. Steven is currently finishing his Master’s of Music degree at Florida State University and working as a graduate assistant. Steve’s program will include works by J.K. Mertz, J.S. Bach, and Joaquin Turina. 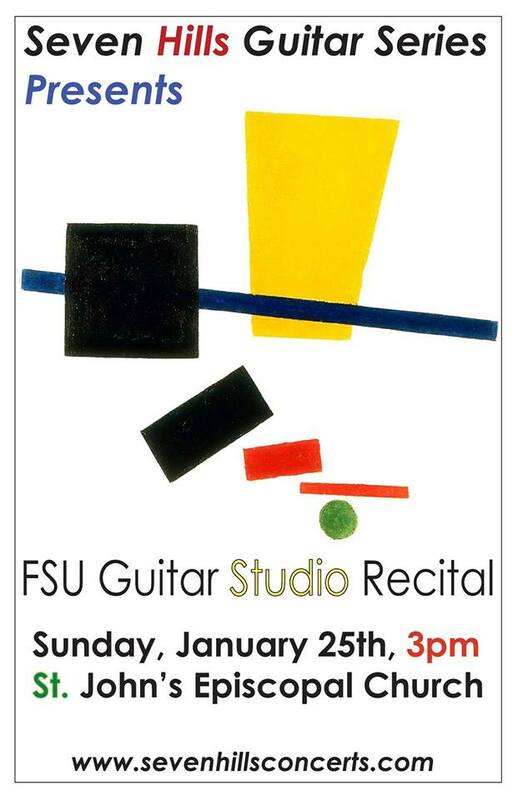 The Seven Hills Guitar Series proudly presents the FSU Guitar Studio Showcase! Lots of great young guitarists – all in one concert! Includes winners of the 2014 Classical Guitar Society of Tallahassee International Guitar Competition (Marco Villa, Matthew Gillen, Steve Lerman, Jessie Acker-Johnson, Vijay Meunier, Kevin Ginty, Michael Morgan, and Benjamin Lougheed). Co-Grand Prize Winners: Marco Villa and Matthew Gillen. In addition to a $100 cash prize (each), they have the opportunity to perform in special concerts in the Spring of 2015. Concert Prize Winners: Steve Lerman, Jessie Acker-Johnson, Vijay Meunier, Kevin Ginty, Michael Morgan, and Benjamin Lougheed They each have the opportunity to perform in special concerts in the Spring of 2015. Congratulations to the winners, and also all of the performers who participated! The competitors all performed at a very high artistic level and it was a joy to hear such powerful, vibrant music! We look forward to the prize concerts and will be posting more information at a later date. We also look forward to the next competition, which will probably be in January of 2016. February 15 @ 3pm: Zohn/Sharpe Duo @ St. Johns Episcopal Church. The musical relationship between guitarists Robert Sharpe and Andrew Zohn began in 1997 as student and teacher. Robert received his first guitar lesson from Zohn at the age of 12 and would continue under his direction at the Schwob School of Music (Columbus State University). Upon Sharpe’s joining the faculty of the Schwob School in 2012, the two formed this exciting new duo and are performing a diverse program which includes Mozart, Gnattali, Soler and Zohn. They have performed to wide acclaim throughout the United States and Europe. Andrew Eliot Zohn is recognized internationally for his work as a performer, instructor, and composer. He has performed concerts on five continents including venues in Beijing, Cairo, New York, Rotterdam, Paris, Vancouver, Honolulu, Buenos Aires, Atlanta, Toronto, and Puerto Rico. He has also served as a guest artist at many of the world’s most prestigious music festivals including the Festival of New Music (Central Conservatory of Music, China) the Guitar on the Mediterranean Guitar Festival (Italy), the Iserlohn Guitar Symposium (Germany), the National Guitar Workshop (USA), and Guitare Montreal (Canada). Students of Andrew Zohn have won prizes in dozens of national and international competitions and have been featured on National Public Radio. Original compositions and transcriptions by Andrew Zohn are published through Les Productions d’Oz, Canada, Tuscany publications (Theodore Presser), and FJH Publications. His recordings for Clear Note and Centaur Records have received wide acclaim from American Record Guide, Classical Guitar Magazine, GuitArt Magazine, Soundboard, Guitarra Magazine, and Rosewood Review. Since his national radio debut on National Public Radio’s acclaimed program From the Top, Robert Fielding Sharpe has received top prizes in national and international competitions. He has been a guest artist at the East Carolina University Guitar Festival, the Tennessee State University Classical Guitar Seminar, the Cleveland Classical Guitar Society, the Greater Cincinnati Guitar Society, the Virtuoso Showcase Classical Guitar Series, and the Fort Worth Guitar Guild. International performances include concerts at the Guitar Festival on the Mediterranean in Italy, the Sauble Beach Guitar Festival in Canada, and the Kras Guitar Festival in Slovenia. Mr. Sharpe has served on the faculty of the Tennessee State University Classical Guitar Seminar and the East Carolina University Guitar Festival. Recently, he joined the music faculty at Columbus State University’s Schwob School of Music. Mr. Sharpe holds a Bachelor of Music from Columbus State University and a Master of Music from Yale University. He is currently completing a Doctor of Musical Arts at the Cleveland Institute of Music under the direction of guitarist Jason Vieaux. April 12 @ 3 pm: Petrit Ceku @ St. Johns Episcopal Church. Petrit Ceku was born in 1985 in Prizren, Kosovo where, at primary music school, he received instruction from Luan Sapunxhiu. In 2002 he moved to Zagreb, where he continued his music education under the instruction of Xhevdet Sahatxhija. He won first prize in the All-Croatian Competition in Dubrovnik in 2003 and in the international Anna Amalia Guitar Competition in Weimar. The following year he won the Emilio Pujol Guitar Competition in Sassari, Italy, as well as the German Andrés Segovia in Velbert. Also in 2004, he represented Croatia in the European Music Prize for Youth in Dubrovnik and won first prize as well as the Croatian Composers’ Union prize for the performance of a work by a Croatian composer. In the same year he became a student in Darko Petrinjak’s class at the Music Academy in Zagreb. Petrit Ceku was the only guitarist in the Ferdo Livadiç International Young Music Artists’ competition in Samobor, Croatia, and won first prize by a unanimous decision of the jury. He won the annual prize of The Croatian Music Youth in 2005. He was awarded the Silver Medal in The Parkening Competition in Malibu, California and second prize in the Belgian Printemps de la guitare in Charleroi in 2006. Winning the Pittaluga Competition in Alessandria, Italy in 2007, Petrit Ceku established himself as one of the leading guitarists of the younger generation. He has taken part in master-classes led by Manuel Barrueco, Leo Brouwer, Zoran Dukiç, Carlo Marchione, Ehat Musa, Scott Tennant and Ana Vidovic. For several years he has attended Strings Only!, the summer school for string instruments, led by the renowned cellist Valter Despalj. Petrit Ceku is currently based in Zagreb. 2014 CGST Guitar Competition Registration Form The CGST is pleased to announce our first ever guitar competition! We hope this event will be a fun and enjoyable experience, with respect given to all participants and members of the audience. In addition to a cash prize ($100) for the Grand Prize Winner, 8 competition winners will receive the opportunity to perform in 4 special concerts in the spring of 2015. The competition will take place on Saturday, December 6, 2014 at the Downtown Leon County Public Library (Meeting Room A) starting at 10 am to no later than 5 pm. Division I: Age 10 – 17. Performance time: 5 minutes. Limited to first 10 entries received. Division II: Age 18 and above. Performance time: 10 minutes. Limited to first 25 entries received. Grand Prize: $100 plus opportunity to perform in ½ of a special concert in the Spring of 2015. 2nd – 8th place: The opportunity to perform in ½ of a special concert in the Spring of 2015. Judges: David Hoge, and Tim Atkinson. Competition Registration. The non-refundable competition entry fee is $25. Application forms should be mailed with the entry fee to: CGST, 2060 Delta Way, Tallahassee, Florida 32303. Make checks payable to CGST. Competition Rules: Once all competition registrations are received, a schedule will be made and distributed via email to all competitors with their approximate competition performance time. All competitors must bring to the competition a typewritten list of the music to be presented (titles, composers, and birth and death (if deceased) dates of composers, if known). There will be only one performance round, so each competitor will only play once. Competitors will be evaluated on their technique, musicianship, and overall presentation. Free-choice program for all divisions – no required or set pieces. All music must be played on a classical guitar with nylon strings; no electronic amplification is permitted. Choice of music is entirely at the discretion of the competitor. It is expected that every competitor’s choice of music fits within the time allowed. If a competitor exceeds the given time allotted, that competitor will be asked to stop but at no penalty to his/her evaluation. Judges’ comments and scores will not be made available to competitors. Competitors are encouraged to inquire for comments from the judges directly only after the competition has ended. Any competition entries received above the number set forth above for Division I or Division II will be returned. The CGST and the judges reserve the right to award any or no prizes. All judges’ decisions are final. Any appeal of the judges’ decisions and failure to follow these rules is grounds for disqualification.